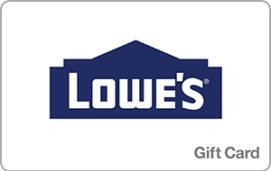 This Lowe's® Gift Card can be redeemed at any Lowe's® Home Improvement Store or at www.Lowes.com. Lowe's stores stock 40,000 products in 20 product categories ranging from appliances to tools, to paint, lumber and nursery products. Lowe's® has hundreds of thousands of more products available by Special Order – offering everything customers need to build, maintain, beautify and enjoy their homes. Lowe's® operates more than 1,750 stores. This is not a credit/debit card and has no implied warranties. This card is not redeemable for cash unless required by law and cannot be used to make payments on any charge account. Lowe's® reserves the right to deactivate or reject any Gift Card issued or procured, directly or indirectly, in connection with fraudulent actions, unless prohibited by law. Lost or stolen Gift Cards can only be replaced upon presentation of original sales receipt for any remaining balance. It will be void if altered or defaced. To check your Lowe's® Gift Card balance, visit Lowes.com/Gift Cards, call 1-800-560-7172 or see the Customer Service Desk in any Lowe's® store. © 2016 Lowe's all rights reserved. Lowe's® and the gable design are registered trademarks of LF, LLC.